, a learned and amiable divine, was born about 1710, and educated at St. John’s college in Cambridge, of which he became fellow and a principal tutor. He was instituted to the rectory of Sturmer in Essex, in 1739, and, in 1741, elected public orator of the university. He afterwards became chaplain to Potter, abp. 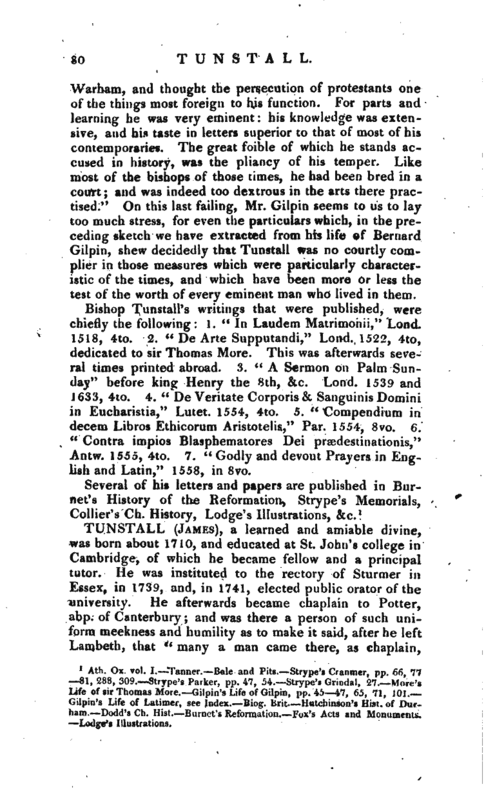 of Canterbury; and was there a person of such uniform meekness and humility as to make it said, after he left Lambeth, that “many a man came there, as chaplain, | humble, but that none ever departed so except Dr. Tunstall.” He was created D. D. at Cambridge in 1714; was collated by the archbishop to the rectory of Great Chart in Kent, and to the vicarage of Minster in the Isle of Thanet, both which he resigned in 1757, for the valuable vicarage of Rochdale in Lancashire, given him by abp. Hutton, who married his wife’s aunt; but the exchange, from many circumstances, di i not answer his expectation; he wished for a prebend of Canterbury. It is supposed that either family uneasinesses, or the above disappointment, hastened his death, which took place March 28, 1772. His writings are, 1. “Epistola ad virum eruditum Conyers Middleton, c.” Cant. 1741, 8vo. In this work, he calls in question the genuineness of the letters between. Cicero and Brutus, of which Dr. Middleton had made great use in his elegant “History of Cicero’s Life;” and shews, that he had not paid sufficient attention to the letters to Atticus and his brother Quintus. 2. “Observations on the present collection of Epistles between Cicero and Brutus.” This was to confirm what he had before advanced, and by way of answer to a preface of Miduleton’s to an edition of the epistles. 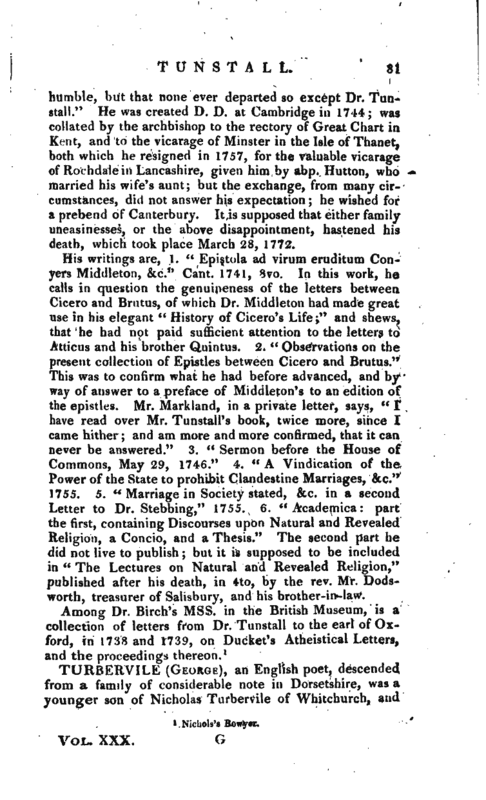 Mr. Markland, in a private letter, says, “I have read over Mr. Tunstall’s book, twice more, since I came hither; and am more and more confirmed, that it can never be answered.” 3. “Sermon before the House of Commons, May 29, 1746.” 4. “A Vindication of the Power of the State to prohibit Clandestine Marriages, &c.” 1755. 5. “Marriage in Society stated, &c. in a second Letter to Dr. Stebbing,” 1755. 6. “Academica: part the first, containing Discourses upon Natural and Revealed Religion, a Concio, and a Thesis.” The second part be did not live to publish; but it is supposed to be included in “The Lectures on Natural and Revealed Religion,” published after his death, in 4to, hy the rev. Mr. Dodsworth, treasurer of Salisbury, ancl his brother-in-law.